The Italian fashion industry is home to some true design icons: men and women who have been runway stalwarts for many years, dictators of refined and sophisticated style in Italy and beyond. Milan Fashion Week sees them come together in a grand celebration of a city that is steeped in the traditions of design and clothes manufacturing. This season was a season of flux for Milan, where we saw some changes in the creative directorships at some houses, with new designers being instated and others leaving for pastures new. We’ve rounded up and reviewed five of the best collections from some of Italy’s pre-eminent design houses. Miuccia Prada is certified Italian fashion royalty. She took over her family’s luxury goods business in 1978 and turned it into one of the world’s premium fashion brands, launching her first ready-to-wear collection in 1989. This season, we were witness to some distinct heritage looks that were primped and preened to form a modern and captivating show. Prada adopted classic sixties forms, with heavy tweed coats, shift dresses, empire lines, elbow-length gloves and Mary Jane shoes, transforming them into contemporary ensembles through her specific use of colour. Her hues ranged from mustards, mossy greens, navy and royal blues, sugary pinks and popping reds, all of which were used to complement and contrast with one another. To ensure that the collection wasn’t too sickly sweet, Prada kept the models’ hair severe and their expressions blank and muted. As a result, the collection retains a sense of polish, with all the pieces looking instantly wearable. This season, Gucci saw former head of accessories Alessandro Michele create his first collection as creative director of the fashion house. Gucci is one of the oldest Italian design houses, having been founded in 1921, and is one of the most popular go-to shows in the Milan Fashion Week calendar. Needless to stay, stepping into those shoes must have been daunting for Michele, and we might have expected a collection that bubbled and fizzed with nervous excitement. His first collection at the helm, however, was sensuously relaxed and clean, keeping lines laidback but leaving traces of high-fashion finishing, with chic pussybow blouses, sheer shirts, calf-length skirts and rich artistic prints. The collection is undoubtedly sophisticated; however, it doesn’t verge on being high-maintenance. On the contrary, the success of the collection lies in traditionally polished looks being deconstructed for a lighter and more youthful look. You can always rely upon Donatella Versace and her team to deliver an eye-popping show. The brand originates from the 1970s and has produced some of the world’s most recognisable prints and dresses. In recent seasons, fashion has seen collections become minimalist and clean in tone, with ‘normcore’ becoming a hit with street stylers all over the world. This season, Versace brought big colour and big branding back with a bang, with statement dresses, jumpers and suits slapped with the Versace logo strutting down the runway. The popping collection certainly packs a punch, but never loses sight of the female physique it is dressing, using large belts to cinch in waists, thigh splits and asymmetric cuts that snake up the leg, and fit and flare dresses that are fun, flirty and flattering. This is perhaps why Versace has been a hit with many of the world’s most self-assured women for years, with Lady Gaga, Jennifer Lopez and Anna Dello Russo all fans of the design house. Shop similar figure-flattering styles worthy of Versace here. The A/W 2015 runway at Pucci saw creative director Peter Dundas’s last collection for the Italian design house. 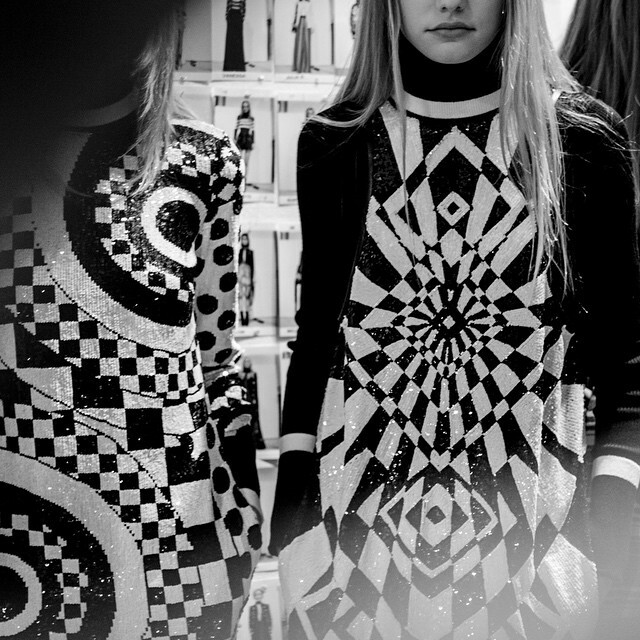 Pucci is famous for their geometric prints, creating kaleidoscopes of colour, and Dundas could not say farewell without nodding to this tradition. Instead of using bright and punchy colours as in previous collections, however, Dundas used a black background for his full-body prints injecting splashes of pink, orange, red and yellow in variably. Black featured prominently elsewhere in the collection too, incorporating striking monochrome looks in patterns of circles, plaid and stripes with textures like faux-fur, sequins and chiffon. The collection creates two camps with regards to hemlines, opting for either super short mini-lengths or long and sweeping floor-length hemlines for the trouser suits as well as the skirts and dresses. Overall, the collection is mature, a stern and fitting farewell that packs in drama but remains lovingly in-keeping with tradition. We can always rely on Emporio Armani to deliver a refined and sophisticated collection, channelling the very height of Italian glamour with sharp tailoring and clean lines. This season, Giorgio Armani, the eponymous head the worldwide fashion empire, ruffled his collection with more relaxed and deconstructed fits, privileging proportion play with increased drama thanks to heavy luxurious fabrics. His series of culottes in particular nod to this aesthetic, completed with wide legs and popping prints to emphasise their expansion outwards. Armani diverged from other designers by dropping waists slightly lower than normal, a fiendish trend to adopt but made wearable through brushed woollen coats; he counter-balances the low waistlines with turtleneck finishes and dramatic popping colours to help elongate the figure, making this trend easier than it looks to emulate. His last eighteen all-black looks are powerful, feminine and incorporate all of the previous looks’ slouchy-ness, kept polished by the lack of colour. The collection, with its contrasts and heady drama, is simply divine. Me encanta la de versace! Nice post !! wonderful collection . i want them all lol.